Day after day, as I investigate this thing called reality, the world gets weirder and weirderer. And this doodle so very aptly depicts the tornado of thought that whips up whenever I try one of these inquiries. First of all.... WHY are there three things represented here when they are all supposed to be referencing just one. One. The one. Me. Me: Right here. This me in this body somewhere. And My: Ok, so now this goes off the rails. There's already a Sybil effect going on as though there can be a 'me' and a 'my'. What is My if not Me? 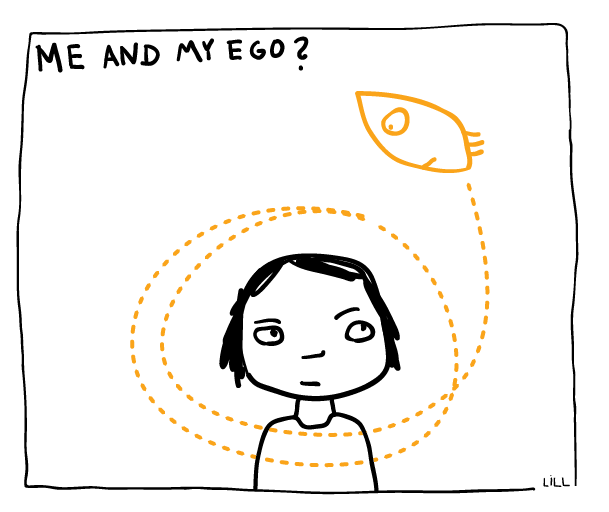 Ego: Now we've got this spaceship circling the body where the me and my is. So whose ego is it? And if it's outside circling around, how is it mine? Me? My? Does the ego belong to someone here? Is it owned by something? If so, WHAT?! What is the thing that owns the ego? I guess I could say that 'my' body owns the ego but if it does, it certainly hasn't been able to control it. Just look at it buzzing around in circles, kind of like this logic. If I own it, why isn't there a remote control for this thing? It's odd how looking for the me always turns into a frustrating circle jerk. I am looking for the me. I am looking at my ego. What and where is this supposed I that is looking?! "Who Am I? ", I ask. No one answers. Are there two things, a you, and then a separate ego? Can the idea of an ego ever exist apart from the idea of a self? Where does the concept of a self end and the concept of an ego begin? Most importantly, do either of these things exist as more than an idea? Like the self, check for whether either actually exist outside of thought? What is the thing or entity that "has" or controls the ego? Then do the same check in reverse. What is the thing that “has” or controls the self?